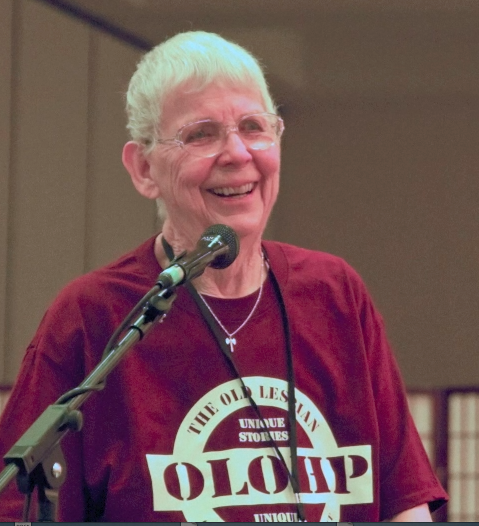 The Old Lesbian Oral Herstory Project, OLOHP, began in 1997 when Arden Eversmeyer started working with women she knew who were ill and dying in her area, Houston, Texas. She began collecting stories from friends as she traveled. And now, she and others are working to collect the life stories from Lesbians 70 and older wherever they are found and whenever they are willing to share them. Arden was also integrally involved in OLOC, Old Lesbians Organizing for Change. She served on the OLOC Steering Committee for 14 years, 7 of those years in the capacity of Co-Director. At a meeting in October 2000, OLOC agreed to serve as a sponsor for the project, helping Arden connect with more Old Lesbians. In their role as sponsor, OLOC has assisted Arden in locating Lesbians over 70 who might be willing to be interviewed, published a variety of articles about the project and published shortened versions of some of the herstories in the OLOC newsletter. OLOC has also raised some of the funds needed to do the work of the project, enabling Arden to focus more of her time and effort on the interviews themselves. There is an urgency inherent in the nature of the OLOHP. Each year, women whose stories the project wanted to gather slip away. Some Old Lesbians die before we are able to interview them; others become unable to do the interview. The herstories of the women who lived through a unique period in time need to be preserved. The women deserve to be recognized for their experiences and contributions. And, just as importantly, there are thousands of other Old Lesbians who need to know they are not alone. Donations can be made to support the project either through direct mail to OLOC or through Paypal. Be sure to indicate you are designating your donation to support the OLOHP. Learn more about the Old Lesbian Oral Herstory Project at www.OLOHP.org. For any of the above, contact: P.O. Box 980422, Houston, TX 77098, fax 713/802-2989, or e-mail arden@oloc.org. Arden talks about her oral herstory project, National Gathering, Oakland, California, 2014 (photo by Sandy Morris).